Although most of us can only ever remember these being the two shops integral with the Mermaid Hotel in High Street (you've got to be slightly chronologically challenged if you can remember when it was just part of the Mermaid), this building was originally built in the late eighteenth century as a single town house. So, surprisingly to most of us, originally the Mermaid was only that part from the arch and to the east - the entrance and bar directly in front of you and the pool room to the right as you walk in. Today's main bar area down the steps to the left as you walk in wouldn't have been part of the hotel. Town House, now two shops. Late C18. Ham stone ashlar with Welsh slate roof (the west side having a gable coping) and brick chimney stacks to each end. Two and a half storeys of 3-bays. Modern shop fronts at ground floor level, with stonework including plinths to sides. 3-first floor windows with 8-pane sashes in simple raised surrounds eaves string course which matches that of the Mermaid Hotel adjoining. 2-small dormer windows, slate clad, with segmental lead covered tops. 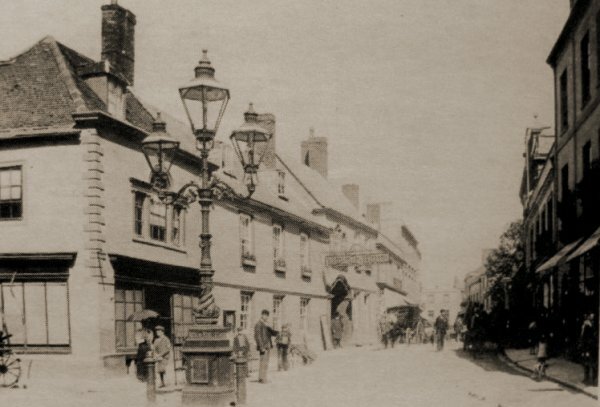 This is the earliest photograph I found of the Mermaid Hotel - it was taken between 1887 (when the 3-light Sugg lamp in the foreground was presented to the town to celebrate the Golden Jubilee of Queen Victoria) and 1897 (when the three storey Capital and Counties Bank seen in most subsequent photographs opened on the corner of High Street and Princes Street - replacing the building seen here at left - Henry White's home and shop). Nos 1a and 1b High Street was the building between the corner shop and the Mermaid's entrance. 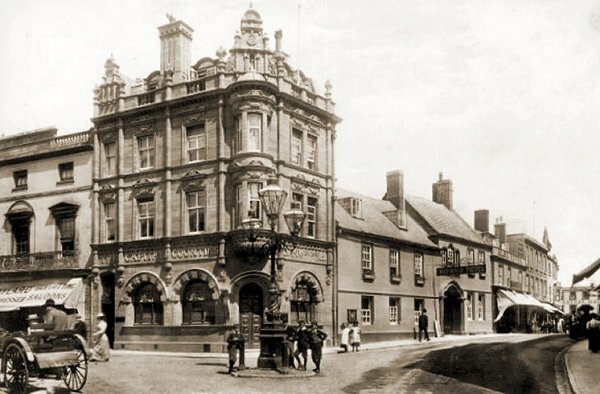 At this time the former town house was part of the Mermaid. This photograph was taken around 1898 to show off the new building on the corner of Princes Street and High Street built for the Capital and Counties Bank and opened in 1897. It does, however, give an uncluttered view of Nos 1a and 1b High Street. Presumably the middle ground floor window would originally have been the location of the front door to the property. 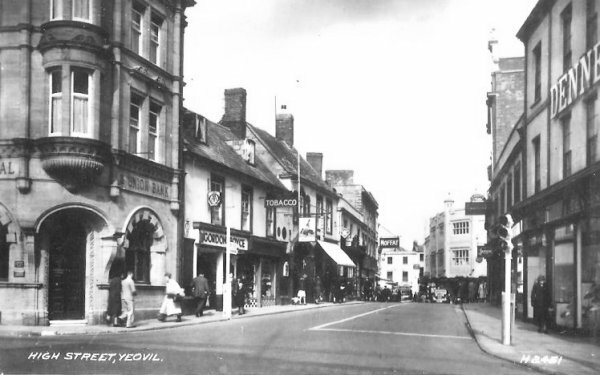 This postcard of High Street dates to about 1955 and shows, for the first time, the shops installed in 1a and 1b. Nos 1a and 1b High Street photographed in 2012. 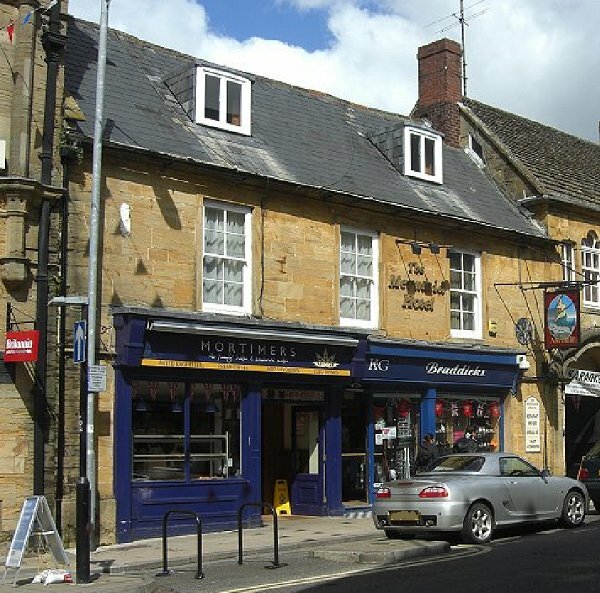 Mortimer's premises was formerly the outlet for "Mrs Dibben's Home Made Cakes" in the 1930s and '40s.